When I go to the grocery store, if I pass by the avocados, I usually buy some. For some reason, I can’t pass them up. Maybe because they’re a (fruit that gets eaten like a) vegetable that doesn’t taste like one. No other fruit/vegetable has that rich, smooth and creamy texture. So this afternoon, I found myself trying to figure out what to do with my 2 ripe (bordering on overripe) avocados. 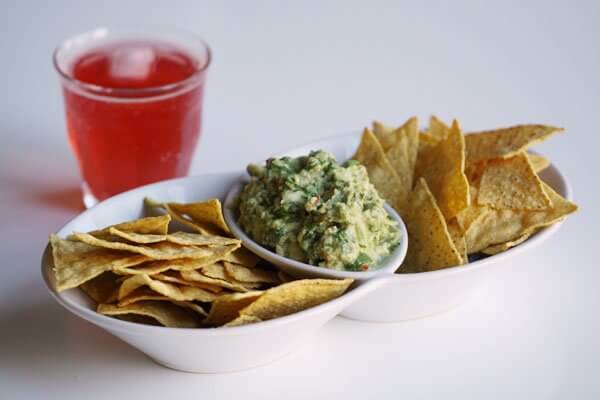 It’s a beautify warm fall day, so I was in the mood for a drink… what better to accompany it than guacamole with tortilla chips. I’ve never made guacamole but I knew it was relatively straightforward. I had most of the ingredients at home. I just needed the cilantro (which was fine, because I also needed the nacho chips). Having had too many guacamoles that were loaded with garlic, I was surprised to find that none of the Fine Cooking recipes for guacamole that I reviewed even contained garlic. Fantastic. So within 5 minutes of being back from the grocery store for the cilantro and chips, I had the guacamole prepared and a drink served. Cheers!